Ganesh Chaturthi or Vinayak Chathurti or Vinayaka Chavithi is celebrated as the Birthday of Lord Ganesha. In India, especially in Maharashtra,Ganesh Festival is celebrated with great pomp..It brings along 10 days of joy, happiness and celebration..
On that day, we make special traditional dishes like Modaks or Vella kozhukattai or modakam as Naivedyam. For Lord Ganesha we must offer 21 Modaks as 21 is his favorite number. 1) In a bowl mix wheat flour,all purpose flour ,semolina together.Mix everything and add a pinch of salt to it. 2) Heat 3 tbsp oil /ghee in a pan. Oil should be slightly warm.Add into flour and mix well with hands.Remove all the lumps. 3) Now start kneading the dough by adding little water at a time.Dough should be stiff than regular chapati dough.Cover the dough and let it rest for 30 mins.Meanwhile ,make the filling for modak. 1) First slightly dry roast Khas khas (poppy seeds ) in a pan and set aside. 2) Slightly roast grated coconut also. 3) Now in a bowl mix roasted coconut and grated jaggery.To it add roasted khas khas(poppy seeds) ,chopped nuts and cardamom powder. 4) Mix everything well and set aside. The filling is ready now. 1) Take a small sized ball from the dough and roll into a thin puri.Roll it as thin as possible.If the cover is thin modak will become more crispy. 2) Place a spoon full of stuffing and place in the center of the disc. 3) Make 8 to 10 folds in rolled puri /disc with 1 cm distance in between.To make a fold pinch the outer layer of the disc a little bit ahead making 1-2 mm thick fold. 4) Now bring together all the pinched folds in the center and press to seal.Make sure to seal them nicely. 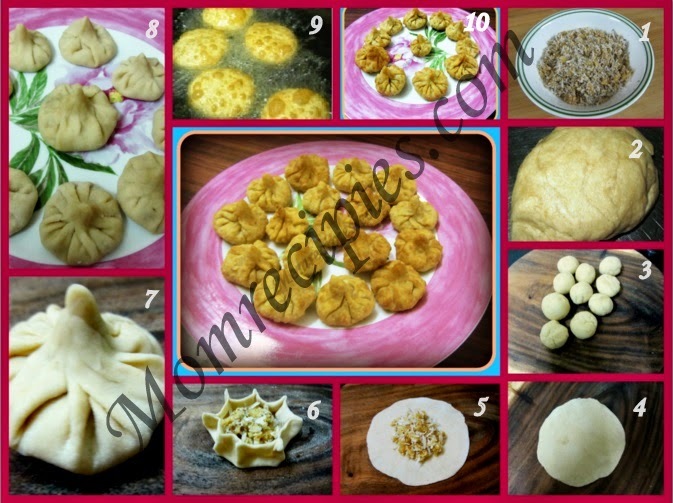 5) Repeat same steps to make rest of the modaks. 6) Deep fry modaks on medium heat till they turn golden brown. 7) Drain them on absorbent paper or kitchen tissues to remove the excess oil. 8) Let the modak cool down completely before you serve . 9) Now the Naivedyam /Prasadam for Lord Ganesha is ready. 10) Once cool you can store modak in air tight container . Instead of whole wheat flour and All purpose flour, you can also use all purpose flour or maida or wheat flour only. Make sure you seal the modak well. Any small opening will lead to the filling being drained in the oil while frying. You can also use sugar instead of jaggery for the filling.